Frank and Norma Zarzecki are an adventurous duo. 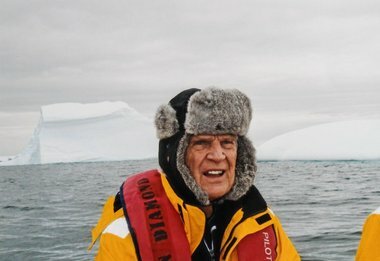 To celebrate Frank’s 80th birthday, they decided to splurge on a nine-day cruise to Antarctica. “It was an adventure trip — something different from any other trips we already had,” Norma Zarzecki said. Hoping to save some money on the trip, they booked air fare through CheapOair.com. It would take several flights to get them to the cruise ship: Newark to Dallas/Ft. Worth, Dallas/Ft. Worth to Santiago, Chile, and then on to Punta Arenas, Chile. The cost of their flights was $4,893.38. The couple headed to Newark Liberty International Airport on Dec. 29, 2013 for their 5:30 p.m. flight to Dallas/Ft. Worth. But the plane, an American Airlines flight, didn’t come in, and the flight was cancelled. A ticketing agent told the couple to head to John F. Kennedy International Airport, where they could catch a direct flight to Santiago. Now at JFK, American ticket agents got to work to help the couple get to their destination. They were booked on a flight to Miami, departing 5:30 a.m. the next day. From there, the couple would fly to Panama City, to Santiago, and finally to Punta Arenas. But the couple said they weren’t allowed off the plane, and after about 90 minutes of waiting, they were flown to Miami, arriving at approximately 11 a.m.
And as they predicted, they missed their connecting flight. “I called our tour operator and they advised us to go back home because we’ll never be able to get on the ship for Antarctica and that they’ll rebook us the following week,” Zarzecki said. So American booked the couple on a flight back to Kennedy because they’d have to wait all day before one was leaving for Newark. Back at home, the couple worked with their tour operator and they were able to go on their trip, without incident, the next week, but they had to pay for the flights all over again. Before they left on their trip, and for 17 months after their return, they say they’ve been unsuccessful in getting a refund for the unused tickets. Their travel insurance denied their claim, and many, many calls to CheapOair and American didn’t bring any positive results, they said. They asked Bamboozled for help. We reviewed the couple’s paperwork and their timeline of events, thinking it wasn’t unreasonable for at least some of the couple’s unused air fare to be refunded. Then we embarked on a month-long ping pong match between American Airlines and CheapOair. We started with American, sharing the couple’s experience and records of their flights — both those that were taken, and those that weren’t. So we turned to CheapOAir, and it looked into the case. So we went back to American, which researched the case again. And again, it said American never received a payment from CheapOair. We asked the Zarzeckis to pull their old credit card statement so we could see for certain who charged the couple for the tickets. So once again, we went back to CheapOair, this time with a copy of the credit card bill. This time, the company’s story changed. Sort of. So we went back to American. It looked again, but the evidence of a payment wasn’t there. It insists it never received anything from CheapOair for the tickets. American also said if it had been paid, it might be able to do something for the customers. But because it wasn’t paid, it couldn’t help. Indeed. And there’s got to be a paper trail. American insists it wasn’t paid for the flights, so there wouldn’t be any documentation for it to show to support its side. But if CheapOair insists it did pay American, it must have some proof that a payment was made. So once again, we contacted CheapOair, asking it for such documentation. It didn’t present us with any documents, but after another review, the company changed its mind. The couple was delighted to get the news, saying they were told a check should arrive later this week. Us too. We’ll let you know what happens.